Stay up to date on current events in Israel. 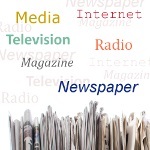 Media in Israel links to Israeli newspapers, magazines, radio stations, television channels and online news sources. TV Channel broadcasts in English, Arabic and French.